"How to drink 167 beers in a weekend." Anyone who has been reading my recent articles. . . or who has spoken with me at beer events. 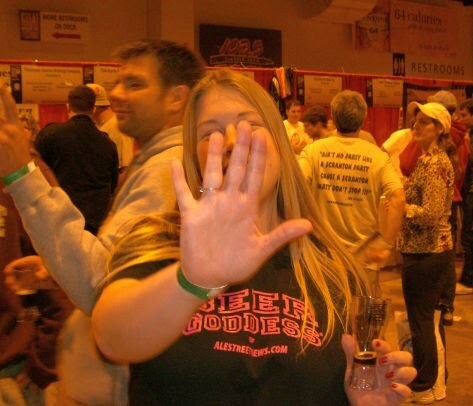 . . or who has been standing in line behind me at the grocery store knows just how much I was looking forward to my very first Great American Beer Festival. A friend of mine warned, considering how much I had been hyping it, that nothing, no event, not even the biggest beer festival out there could possibly measure up. Well, folks. . . he was wrong! The Great American Beer Festival is one of the greatest and most awesome things I have ever done! The crowd, the energy, the solidarity among beer drinkers from across the globe is infectious! Even on the airplane from Jersey to Colorado there was this vibe filled with passengers wearing all kinds of swag and exchanging homebrewing tips, beer related anecdotes, Michael Jackson memories, you name it. I hate to fly. I typically drink in the airport until I hear the final call for boarding and then pass out right about when the flight attendant starts yammering about emergency exits. I consider it a public service. Not on this flight! No way. 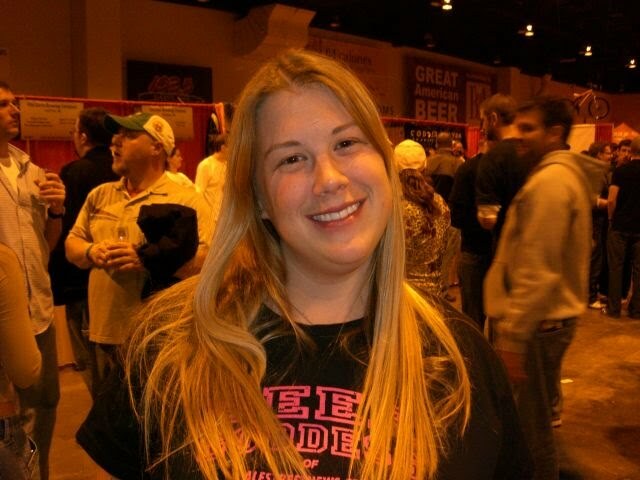 So if you've never done a GABF, you must go next year! If you don't fly, drive. If you don't drive, take a bus. If you don't take busses, start walking (as soon as you finish reading this article if you're on the East Coast). It is that good! And when you do go, remember these tips for completely maximizing your experience. Over 46,000 people attended the festival this year! (There are only 4 sessions, and 1 of them is comparitively exclusive.) I trust that you can do the math here. Arrive early. The doors don't open until 5:30 for the evening sessions, true, but if you're not there early getting in will seriously cut into your drinking time. Take the opportunity to talk strategy, or meet other people on line around you, or make a pretzel necklace. This is how thick the crowd was arriving 45 minutes early. 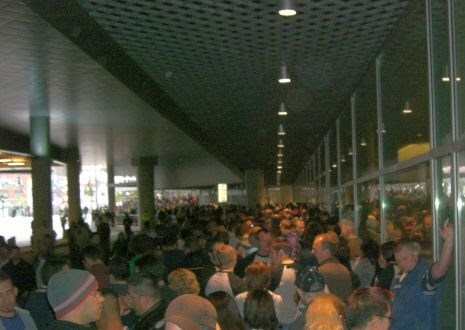 Don't be discouraged by this though, there is plenty of beer for everyone (especially in the first two sessions). Once inside, you will notice that the fill line on your cup is signicantly lower then at other festivals you have attended. 1 ounce. I know what some of you must be thinking (because I thought it too). "How much beer can I possibly drink one ounce at a time when there are thousands! of people here. " Or "I'm going to stand and wait on line while a brewer explains his whole process to each and every thirsty sampler for 1 ounce?!?" Before you get upset, please resist the urge to spout obscenities about the wait on line, or your insatiable thirst, or the cost of your plane ticket out and simply take a moment and look around! They're professionals and they've done this before. Firstly, all the beer is distributed from tap to pitcher to glass rather than directly from tap to glass. This may not sound like a big deal, but it cuts considerable time from the distribution process. Secondly, the people pouring your beer are volunteers. This may not be ideal for people that want to chat with everyone with a name tag on, but it's perfect for those of us who hate to be behind that guy. That's not to say the volunteers aren't friendly and wonderful, they absolutely are! Many will give you a taste of everything they have to offer because the first and second points mean there are very few lines, especially for lesser known micros and brewpubs. Since typically each station offers 4-5 beers, that's 4-5 ounces per stop in some cases! I'm no math expert, but that beats the pour at an average beer festival! Take little to no time, at least in the first hour, to get wrapped up in the drama and the chaos that is all around you. There is a ton of lures away from beer that will best be visited later if (and probably when) a break is required. So tell the survey people, or folks that want to stop and read your shirt, or autograph seeking paparazzi to beat it! Make sure to do this with a beer in your hand. Also, don't blindly follow the current of people or you will be waiting in line for one ounce, and only one ounce, of beer from 'big names' that you can buy at any liquor store with a decent beer selection. Stick to places with very few people! I can't stress this enough. There were 432 breweries at the festival this year. 30 or so got crowded, really crowded. The rest I suspect had incredibly happy volunteers! Don't be surprised if in doing this, people catch on to how smart you are and you develop a bit of a cult following. Still, don't stop to pose for pictures, at least not yet. Now that you have attracted a bit of a crowd of people who realize that your strategy is pretty solid, you'll probably want to just drink about a dozen ounces or so back to back without station jumping. 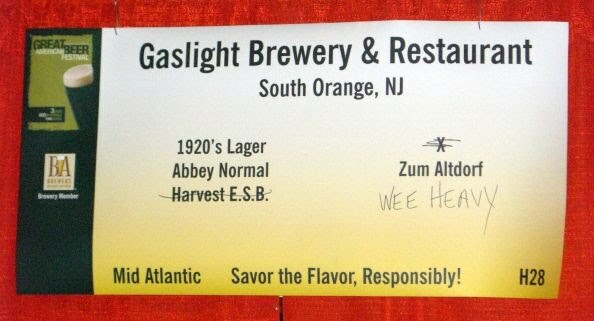 Fortunately the whole country is represented at GABF so you're bound to find a local brewpub that has a station, let's say, in the Mid Atlantic area. Bring everyone over. Impress the crowd and volunteers alike with personal anecdotes about your friend's dream of detroying their jukebox, or how you know the brewer personally, or that you attend beer club meetings there, or, if applicable, that this happens to be the place where you won your first homebrew competition. Recommend your favorites to your new friends as they get their cups filled (at least to the line anyway). Insist on the "one for them, one for me" method! Then make your way over to the Pro-Am table and taste up to 40 beers you can definitely say your friends back home have never had. As an added bonus, here's where you can talk to some brewers, if you like that kind of thing, without getting in anyone else's way. Finally, realize that there is no way you'll sample all 2052 beers, so enjoy some of the extras. 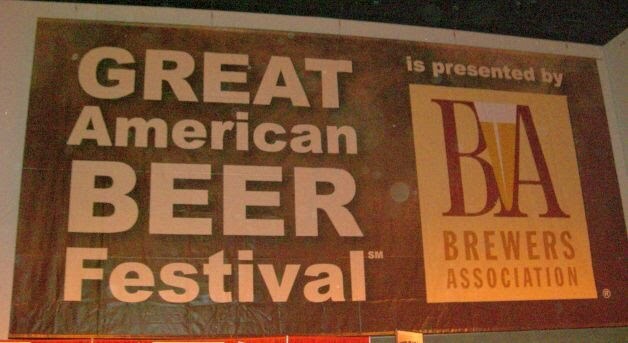 The GABF has lots of other things to do! They've got a 'silent disco', where people dance with headphones on (it's actually very amusing to watch), a book store with scheduled signings, a seminar area where some big named brewers come and share their wisdom with groupies like me, swag tents outside (which I didn't see, but heard were pretty extensive), a free arcade, a VIP lounge from Draft Magazine, Beer Pong, vendors all over the place, and of course chair massages! With all these people there is sure to be a line at these perk stations, but when you drink like a girl, the beer comes to you and you get to enjoy the best of both worlds! Still thirsty for more beer articles? Visit www.beernexus.com!